BRIDGEND, WALES (June 23, 2015) — My train journey yesterday was successful. It was close, but I made the four tight connections and arrived in Aberystwyth, Wales, from Thurso, Scotland, on schedule. It took 15 hours. My friend Tim Palmer was there to greet me as I stumbled out of my carriage. I went from rainy, cold Scotland to warm and sunny Wales. 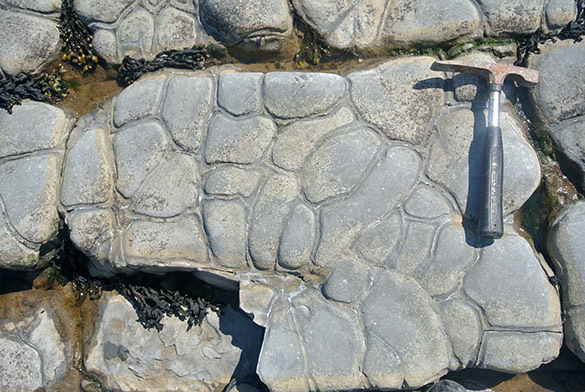 The top image is of the Triassic/Jurassic transition at Lavernock Point in south Wales (see below). 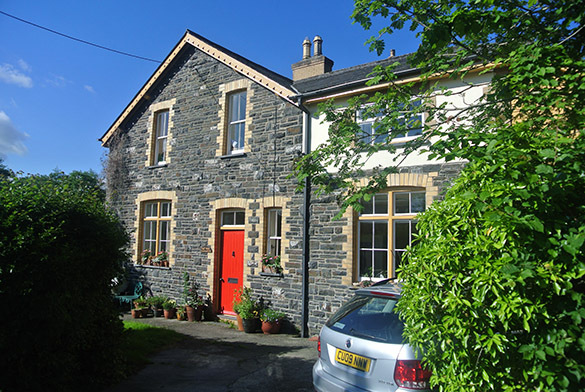 My first Welsh night was with Tim in his great country home (with is wife Caroline) on the outskirts of Aberystwyth. It is called The Old Laundry because of its function on a previous manorial estate. I had my best sleep here for the entire trip. Quiet and beautiful. One of Tim’s passions is the study of building stones in England and Wales. 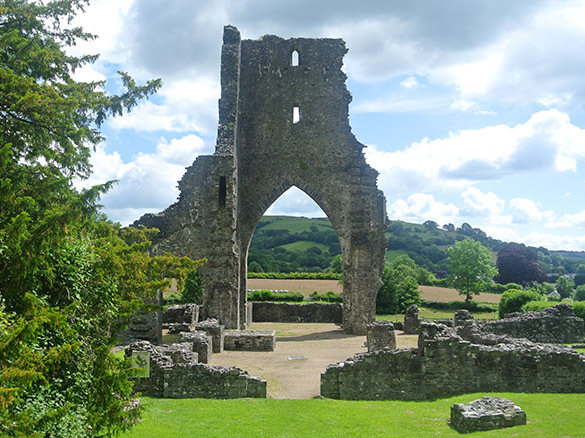 As we drove to southern Wales for our geological work, we stopped by interesting stone structures, including the ruins of Talley Abbey, a 12th Century monastery. 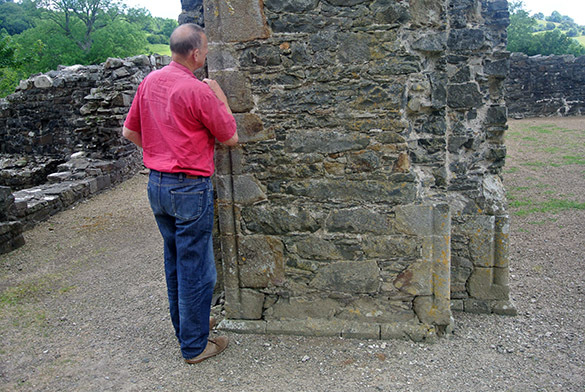 Tim is here examining the dressing stones on a corner of this pillar in the Talley Abbey ruins. I learned that these dressings are usually made of stone that can be easily shaped, is attractive, and will hold sharp edges. In many cases these are called “freestones”. 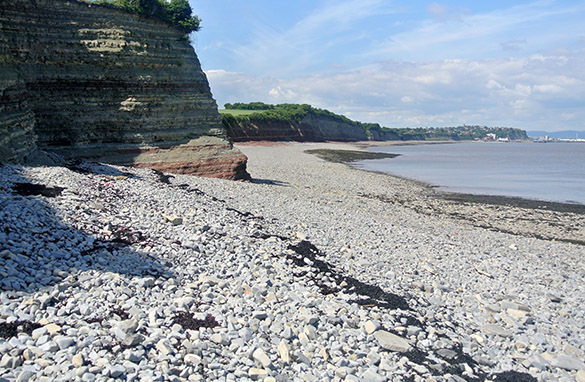 Our first geological stop was at Lavernock Point on the southern coast of Wales. We looked here at the boundary section between the Upper Triassic and Lower Jurassic (Lias). In this view we see an alternating sequence of limestones (buff-colored) and shales (dark gray) of the lower Lias. These are marginal marine units with oysters and ammonites. On the left side of the image you can see a broad niche cut back into the cliff. This is the site where the first carnivorous dinosaur in Wales was recently excavated. It is also one of the oldest Jurassic dinosaurs since it was discovered just above the Triassic/Jurassic boundary. More on this dinosaur later. 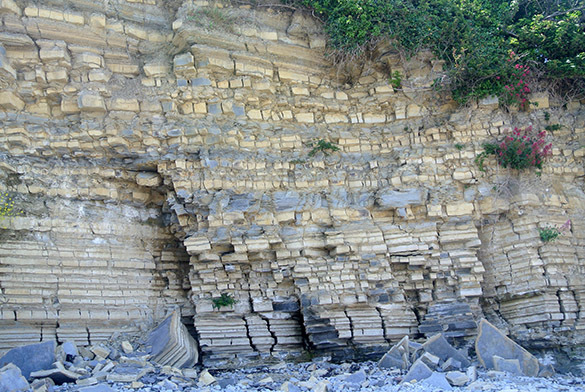 We wandered across broad intertidal wave-cut platforms at Lavernock Point looking at the limestones and shales of the lower Lias. I was intrigued by these features on some bedding planes. They are not desiccation cracks, but rather some combination of jointing and weathering. The oyster Liostrea hisingeri is very common in this part of the Lias. 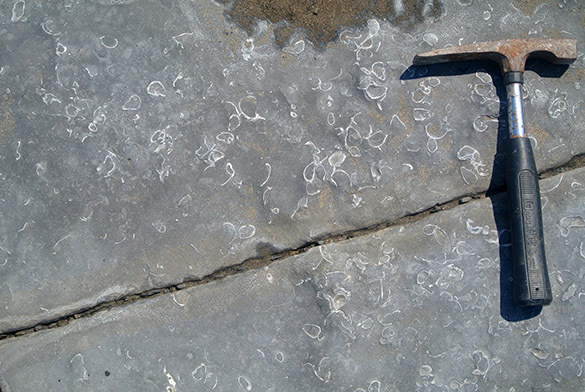 In the limestones it is sectioned by erosion, resulting in these shelly outlines. 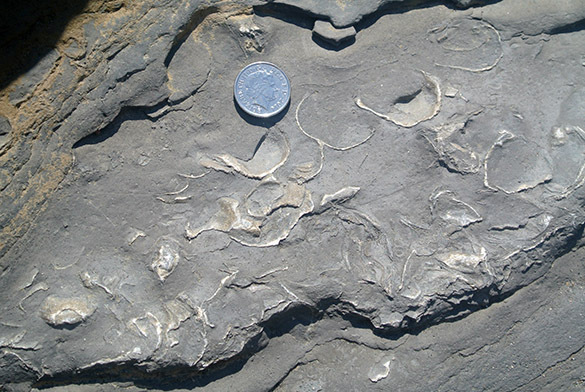 When Liostrea hisingeri is present in the shales, it is preserved three dimensionally. After our geologizing was done for the day, Tim and I drove up into the Rhondda Valleys just north of our hotel. This was at one time a very busy coal mining and industrial region, but the mines are closed and most of the heavy industry has moved elsewhere. 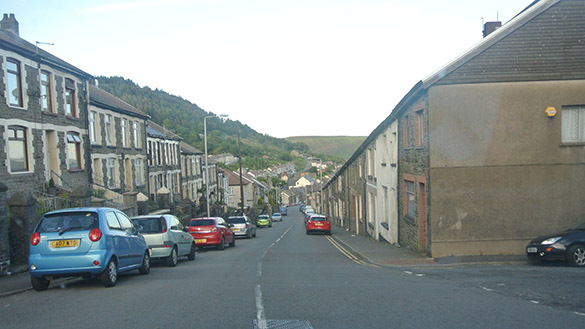 Above is a view down a street in Tonypandy, one of the more famous towns of The Valleys. There were massive riots here in 1910 which eventually a minimum wage for miners in 1912.